Product prices and availability are accurate as of 2019-04-02 16:20:56 EDT and are subject to change. Any price and availability information displayed on http://www.amazon.com/ at the time of purchase will apply to the purchase of this product. 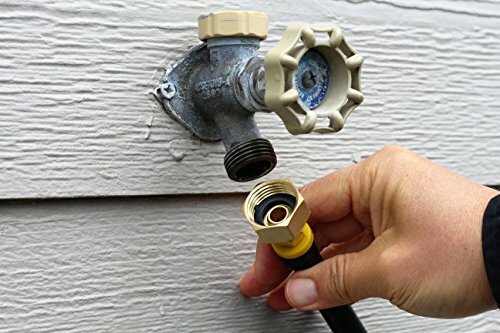 This adapter allows you to easily connect an air compressor to blow out lawn sprinkler systems, pipes, faucets, sillcocks, hose bibbs, or spigots. The flexible hose allows the adapter to access tight spaces and minimizes stress on piping and fittings. 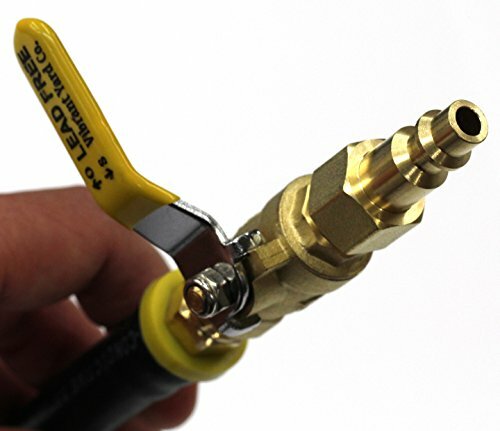 One end of the adapter has a quick-connect plug, commonly known as 1/4" Industrial Interchange plug, designed to connect to most air compressors. The other end of the adapter has a female garden hose faucet/spigot/spout connection. If your sprinkler system does not currently have a garden faucet, the winterization instructions which are included show the proper location to install a garden faucet. Winterizing your sprinkler system is easy with this adapter. We use only the finest quality and most durable parts to fabricate this industrial quality, outdoor rated winterizer. The water and oil resistant Insta-grip hose is made in the USA. We use food-grade vegetable oil and non-toxic plumber's pipe dope only in the installation process. Most commercially available brass fittings contain up to 8% lead, but for your health and safety, the lead-free brass fittings in this item have been tested by a United States CPSC-Accepted Testing Lab and certified to contain less than 0.25% lead. The manufacturer of this adapter, Vibrant Yard Company LLC, is Better Business Bureau Accredited Business. Adaptor to winterize underground irrigation sprinkler systems and outdoor faucets Pre-assembled length: 10 inches (approximate). Pressure rating: 250 psi with 4:1 safety factor. 100% outdoor rated, virtually indestructible, impervious to water and oil All metal parts are brass. Hose is 3/8" ID Goodyear Insta-Grip, made in USA. Assembled in Andover, Kansas, USA using domestic and imported parts. Includes printed instructions.